I spent most of the weekend on my non-horsey life (laundry, cleaning, installing new floors), but I was able to squeeze in a lesson on Sunday morning. I feel like we are in that nitty-gritty phase where every lesson exposes tons of “holes” in our training, which is both exciting and difficult at the same time. I say holes in quotes, because I don’t actually consider them holes, as Rio is still young and learning a ton every ride. It would probably be more accurate to say that every lesson shows us buttons we don’t have installed just yet- which is totally ok. It just motivates me to keep working, and to try to ride every ride to the best of my ability, so that I can make him the best possible horse he can be. Every lesson is also exciting, because it makes me realize that he DOES know some stuff now, and he is becoming so much more rideable. In our Sunday lesson, we focused on riding a very collected canter. This may not sound that exciting, but it is new for us. When I first got Rio, he basically had a 14 ft stride, and I am not even joking. 17.3 hand horse with no idea how to carry himself equaled a HUGE step. I had it in my head that he just needed to collect his stride a hair to a standard 12 ft stride and we would be good to go. In hindsight, that was definitely a bit naive. All well schooled, top level hunters can collect and extend like a dressage horse, and thanks to Trainer we are finally working on installing those buttons on Rio. Let me tell you, it wasn’t perfect. Rio isn’t too sure about jumping from such a collected canter, and my eye was just not there on Sunday. We of course were focusing on the quality of the canter and therefore jumping small jumps (like 2 ft and under) and I couldn’t see a distance to save my life. I am very thankful that we are hashing this all it now, and that my saintly boy is always so willing. The immature part of me is antsy to start jumping bigger, but the logical part of me knows that we are laying ht essential ground work that will allow up to jump and height successfully in the future. It is not so much that I crave huge jumps- more like I haven’t tested Rio over anything bigger then 2’9 at this point, and I am SO curious as to how he will jump style-wise. 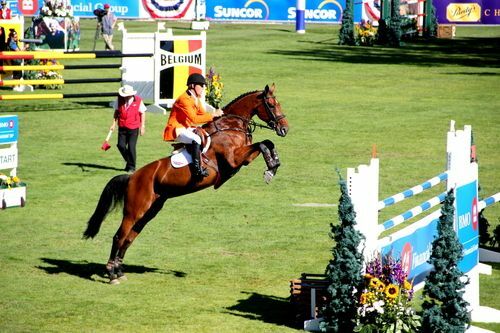 Being as large as he is, those tiny jumps don’t exactly make him exert himself, and I want to know that his jump style will looking like over larger fences when he really has to TRY. For now, it will remain a mystery! I have to say, I’m kinda jealous of your chore-filled weekend. Mine was fun but now that the week has started, I’m staring at the pile of stuff I didn’t do and silently (or not so silently) weeping. I am down to like 3 pairs of riding socks until my order comes in so my laundry is happening more often than normal lately. Working with a young horse is so intriguing to me. I’m not skilled enough myself to feel confident with a blank slate but I love reading about it. Believe me, it’s scary! I’m always worried I’ll mess him up. I work very closely with a trainer for this very reason. Definitly very exciting though! I cannot see a distance to anything under 2’6″. There are just too many options, I try to pick them all at the same time. Lol right?! Same here, I’m a total mess.